A scaffold can be generally defined as a temporary structure supporting a platform positioned at an elevation above the ground. Its purpose to provide a working surface to support workers and their necessary tools and material. A scaffold must have at least one platform and can be supported from the ground or suspended from overhead supports. The connection between the transoms and ledgers and the standards is normally by a specially designed mouth piece and rosette device or by other modular connection methods. The connection device is also used for the connection of the various diagonal members or braces. 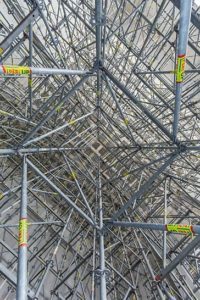 Tubular metal frame scaffolding systems are probably one of the most commonly used scaffold system in the construction industry. The scaffold consists of welded steel or aluminum frames connected by cross braces to orm a framework to support scaffold planks or other scaffold platform systems. The arch frame scaffold is very common in the masonry construction sector as it allows convenient movement between the frames for distribution of materials. Outrigger brackets or side brackets can be installed on the side of the scaffold at varying levels to provide a convenient personnel platform for work at the building face. Fall protection is, by far, the greatest safety challenge for erectors and all types of scaffolding and access systems. Over 70% of all scaffold related fatalities are falls from the platform or access. In addition, the use of most personal fall arrest systems (PFAs) for scaffolding represents even greater challenges. PFAs used on scaffold and access devices must contend with difficult issues such as: anchorage, freefall, swingfall, energy absorption, obstructions and impalement hazards. Guardrails are by far the most common and effective fall protection tool for supported scaffolds, however, they are not an easy solution for scaffolds while being erected or dismantled or even for other access systems such as: swingstage scaffolds and powered elevating work platforms. The SIAC Fall Protection Committee is dedicated to working with the SIAC member firms and affiliates, such as regulatory and standards agencies as well as fall protection equipment manufacturers to develop and communicate fall protection “industry best practices” for scaffolds and access systems. The provision of powered access to a system of scaffolding by means of a platform fixed to a vertical mast attached to the side of the building under construction or maintenance.